A JCB business which has powered its way to international success today celebrated the production of half a million engines – enough to stretch from London to Paris. Four-cylinder diesel engines first began rolling off the line at JCB Power Systems in Derbyshire in November 2004 when the company employed just 64 people and in the first year of production less than 10,000 engines were produced. The Foston-based business has grown dramatically since then and the workforce now stands at almost 400. 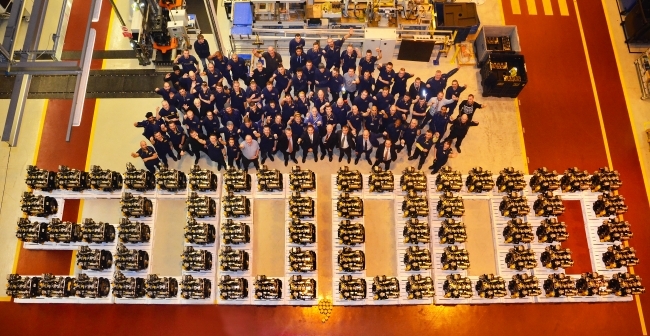 Now employees have celebrated the production of 500,000th engine and staggeringly, if all half million engines were laid out end-to-end, they would stretch from London to Paris. JCB Chairman Lord Bamford said: “There have been many great achievements at JCB over the years and engine manufacturing is a truly great success story. In 2004 we relied entirely on external suppliers for our engines. Today the JCB engine powers more than 70% of the machines JCB makes and we sell it very successfully to other manufacturers for a wide variety of uses. It took eight years to build the first 200,000 JCB engines and only five years to build the next 300,000 – highlighting the rapid growth in the business. The expansion also saw JCB India begin production of engines in 2010 at its headquarters near Delhi. 2017 has been a milestone year for JCB Power Systems. The company has invested £10 million at its Foston plant in new CNC machining centres and associated automated processes. This investment alone has created around new 30 new jobs and allowed the company to produce cylinder heads, engine blocks and bedplates – the major engine components – in-house for the first time, boosting efficiency and ensuring that very demanding quality targets are met. Production has also started this year of a brand-new fuel-efficient 3-litre JCB engine following the culmination of a £31 million investment programme which included support of £4.5 million from the Government’s Regional Growth Fund. It is the third engine line to be launched by JCB since production first started and joins the 4.4, 4.8 and 7.2 litre models. In 2016 the company also celebrated winning two Queen’s Awards, including one for Innovation, for the development of the JCB EcoMax engine, with its low-emission combustion system. The other award was for International Trade, recognising growth in overseas third party sales of the JCB engine family by more than 325% between 2012 and 2014.